For a limited time, new SogoTrade customers will receive 100 Free Trades good for 30 calendar days. The 30-day period begins when the account is approved and can start placing orders. These free trades are only applicable to online equity trades of stock priced at $1.00 or higher and to the base commission of online option trades (per contract fees will still apply). 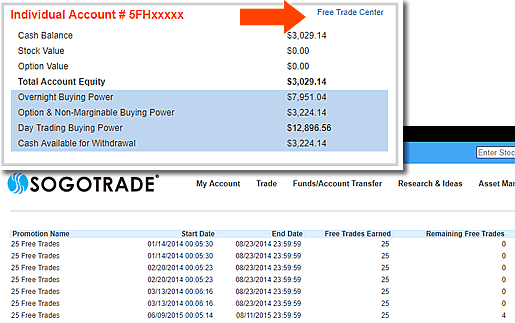 Free reward trades do not apply to broker-assisted trades or stock trades of stock priced less than $1.00. Free reward trades carry no cash value and will expire worthless if unused. The 100 Free trades promotion is only available to new customers of SogoTrade Inc. Current customers and former customers who open new accounts are not eligible for this free trade promotion. The status of your free trades reward can be monitored via the Free Trade Center*. *SogoTrade’s Free Trade Center exists on our trading site. You can find the link when you login to your account. It is located to the right of your account number as shown below. When you click the link, you will then be redirected to the Free Trade Center page where you can monitor how many free trades you have and when they will expire. When you complete an account transfer, valued at $10,000 or higher, from another brokerage account to your SogoTrade account, SogoTrade will reimburse you, up to a maximum of $100, for the account transfer fees imposed by the other broker. You must apply for the ACAT reimbursement by completing and submitting a SogoTrade Account Transfer Reimbursement Request Form and provide an account statement to SogoTrade as proof of the imposed transfer fees. The Form and statement can be mailed or faxed to SogoTrade. Reimbursements will be made to your account via a credit within 30 days of receipt of the Form and Statement. Your SogoTrade account must remain open and maintain a minimum equity of $500 for a period of at least six months, or SogoTrade may charge the account for any transfer fee reimbursement credits. SogoTrade reserves the right to terminate this offer at any time without prior notice or extend the offer at its sole discretion. Offer is not valid for internal transfers between any two SogoTrade accounts. Offer valid for a limited time. Void where prohibited. Refer a friend or family member to SogoTrade and receive 25 free trades when he or she opens a qualified SogoTrade brokerage account, meets the $500 account equity minimum, and places one online equity trade. Referral rewards will be valid for 90 days from issue date and can be used for real-time market and limit orders. There is no limit to the number of friends you can refer or the quantity of free trades you can earn.